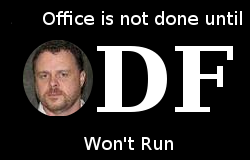 WE KNEW that the ODF Alliance would issue such a statement and eventually, as promised, it did. Here is their document [PDF] and also the press release, which they have channeled further via PRNewsWire. The OpenDocument Format (ODF) Alliance today cautioned that serious deficiencies in Microsoft’s support for ODF needed to be addressed to ensure greater interoperability with other ODF-supporting software. Once again they did it. Microsoft is telling the world that they are improving interoperability across existing office formats and applications thanks to their native support for the ODF file format, a leading office file format based on existing ISO standards. But it could not be further from the truth. Microsoft are actually killing ODF, like the digital nazis that they are. Kissinger is proud of their spiritual sons. What kind of white phosphorus are they using ? First they don’t write to ODF but to a canada dry version that we shall call MS-ODF, a variant filled with countless exploding mines, thrown from the air like any coward would do. Namely they are implanting the proprietary Excel formula syntax right inside files expecting the ODF formula syntax as exposed by all the ODF compatible applications out there. Since formulas are used in many elements such as charts, conditional formattings and so on, it wrecks any serious spreadsheet. While Microsoft Office 2007’s latest service pack purports ODF support, it’s not complete, nor does it appear designed to provide usable interoperabilty with other ODF-capable applications. * The Sun ODF Plugin for Microsoft Office gives users of Microsoft Office Word, Excel and PowerPoint the ability to read, edit and save to the ISO-standard Open Document Format (ODF). * The plugin works with Microsoft Office 2007 (Service Pack 1 or higher), Microsoft Office 2003, XP and Microsoft Office 2000. Yet Microsoft Office SP2 claims to have a fully compliant version of ODF, and that’s probably true, as defined by the specification. It’s just completely useless at interoperating with other vendors products. This is not interoperability, it’s an attack on the very concept. This discussion can be also seen in ZDNet where Microsoft is claimed to be sending employees to spin (based on a whistle-blowing Microsoft employee). Here is a collection of links criticising Microsoft’s ODF approach. There is also related coverage in non-English languages. “Microsoft is already propagating fluffy press releases about “interoperability”. It talks about ODF, so maybe they try to drown out the many critics.”Microsoft is already propagating fluffy press releases about “interoperability”. It talks about ODF, so maybe they try to drown out the many critics. Matthew Broersma parroted Microsoft at ZDNet and Elizabeth Montalbano, who is focused on Microsoft at IDG, did the same thing. This means that the real news about Microsoft destroying interoperability will be washed away by its PR. Microsoft employees and their partners twitter in harmony about a Patrick Durusau writing a letter on MSODF. He has not been reliable ever since his trip to Microsoft [1, 2, 3, 4, 5, 6, 7]. As most of you already know, I spent the month of October in a marathon of speeches about ODF. During the marathon, I had the opportunity to attend some presentations about Microsoft Interoperability and would like to share with you here some information about that cool experience (the post is long but worth a read). The first opportunity to see our friends from Redmond featuring the theme was at the rally held by them at the end of Latinoware 2008. I do not call that a presentation, because they did not allow questions from the audience, as a rally. Luckily the audience was not that big and I was on that room just be able to “write the facts” about the speech. Is Microsoft’s AstroTurf Against ODF Still On?